Prepare yourself for lashings of laughter as Desi Laughter Nights 2019 comes to Doha! A line-up of exciting and entertaining comics from India and not to forget a stage for Doha’s very own stand up comics to perform at the prestigious REGENCY HALLS. A 3 Hour laugh-A-thon which is sure to keep your funny bone tickling. 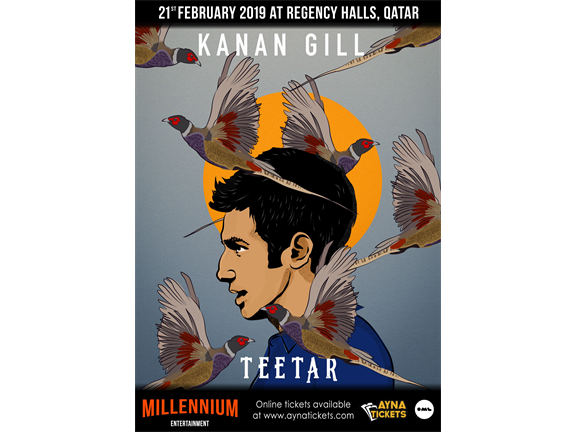 February 21st 2019 kicks off with KANAN GILL live for the first time in QATAR presenting his standup special “TEETAR”. 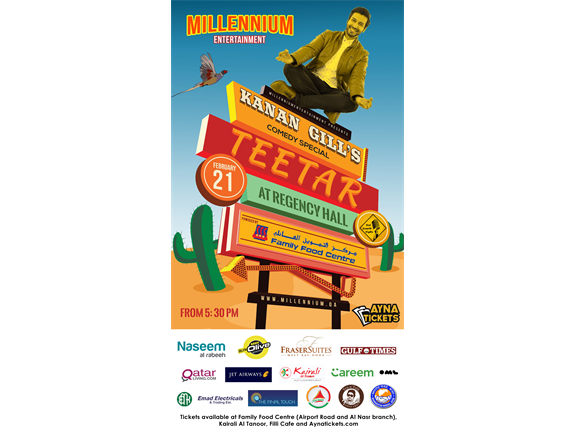 Kanan Gill’s latest special, ‘TEETAR’ is a personal, observational and deeply stupid follow up to 2017’s Keep It Real. In this hilarious one hour show he juggles ideas from Julius Caesar’s death to marching to bands and his building societies. The show also explain what “TEETAR” means. The event if for 15+ audiences only. The organizer holds the right to disallow guests below 15 years of age. Tickets purchased via AYNA TICKETS (Official Ticketing Partner) or through offline ticket sales counters as advertised by MILLENNIUM ENTERTAINMENT. No other ticket sources will be accepted. Parking of 45 vehicles permitted in Regency Halls car park. Parking can also be used at AL AHLI Stadium during the event or at THE MALL in front of Regency Halls. No valet parking at the venue.